I’ve been doing a lot of reading lately on blogs and in books about various styles of preschool education as I begin to think about homeschooling Eli. Waldorf, Montessori and Reggio Emilia all have aspects that have captured my attention. One thing that I find attractive about Waldorf philosophy is the importance placed on using toys that encourage open ended play. I also like that the types of toys recommended are made from natural materials. I doubt we will ever do away with plastic toys entirely in our household, but I have begun a process of weeding out all that aren’t particularly loved and are contributing to general clutter. And I’m making an attempt to make many of his new toys myself. (Also here and here.) For those that we buy, I’m being more conscious in making decisions in favor of quality materials and toys that inspire creative play. If I make many of his toys we will be buying fewer toys, so those we do purchase can be better quality (unfortunately, otherwise known as more expensive). Creative Play for your Toddler by Christopher Clouder and Janni Nicol is full of wonderful toys that can be made at home. 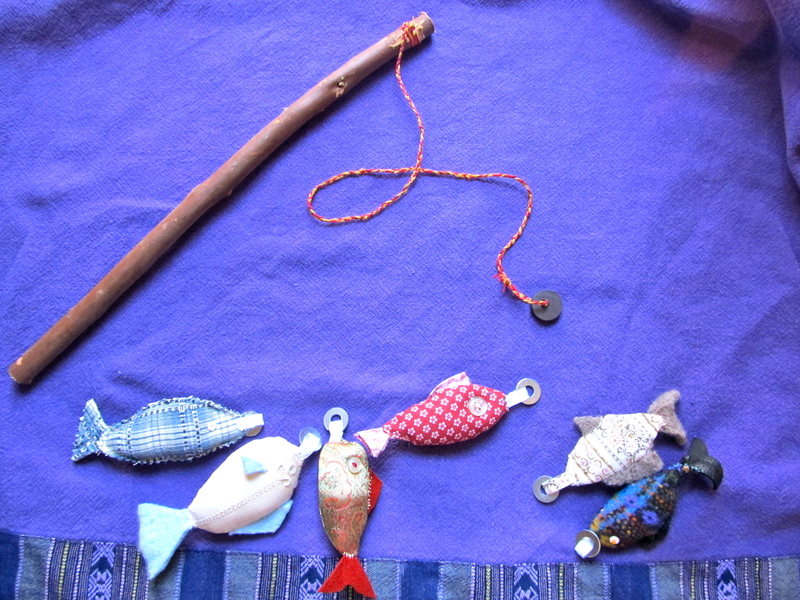 The first project I’ve made from it is the Felt Fishing Set. I’m sure you will see me refer to this book many more times in the future. The fishing set I made isn’t felt. The felt I have at home is made of recycled soda bottles, and the wool variety is pretty expensive. Also, if you have been following this blog for a while, you know that I like to use what I have on hand. This is a great project for putting those little scraps leftover from other sewing ventures to use. I will have fun pointing out to Eli which fish were made from a former favorite shirt or his Great Great Aunt Jenny’s linen napkin. Oh, how I loved this shirt… loved the elbows right off of it, unfortunately! The directions in the book call for using magnet washers. I went to Lowes, Home Depot, Michael’s and Walmart… nobody seems to carry them. 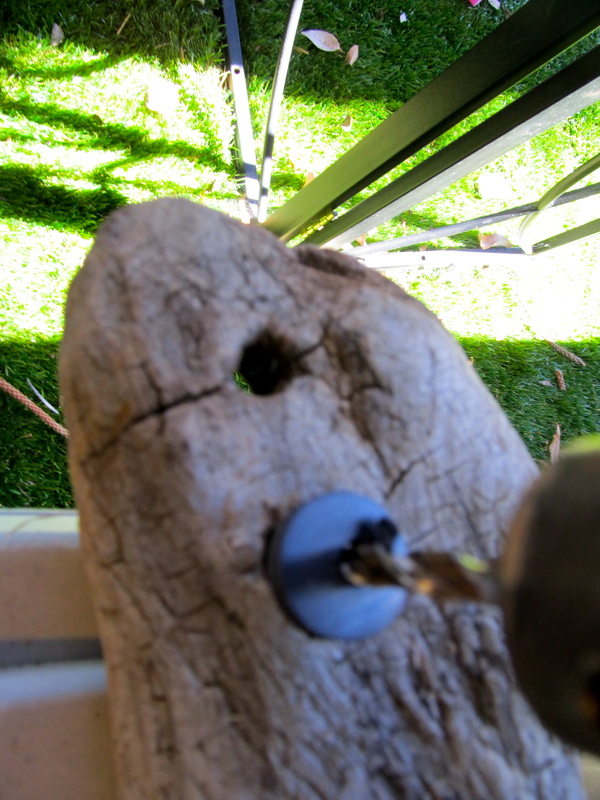 Then it finally occurred to me that perhaps I just needed to drill a hole in the center of a coin-shaped magnet. Easy peasy! Excuse the blurry photo… It’s hard to hold an electric drill and take a picture with the other (non-dominant) hand. My lack of attentiveness with the metal washers on the fish also held up this project by a bit. Toward the end I happened to look a little more closely at the packaging out of which I was pulling the metal circles. In my defense I grabbed it at the store while accompanied by a two year old determined not to ride in a cart or be carried but instead to touch every last item in the Lowes. I’m not supermom enough to inspect packaging very closely under such circumstances. It looks innocent enough, but listen closely and you’ll hear the Jaws theme playing ominously in the background. As to why I didn’t notice once I was home and removing washer after washer from the package to sew onto fish after fish I have no explanation or excuse. I’m just glad I noticed before I gave any of the fish to Eli! Going back to the store for new washers and then swapping them out set this project back by a few days though. Hopefully I’ll have learned my lesson before my next trip to get materials for toy making! 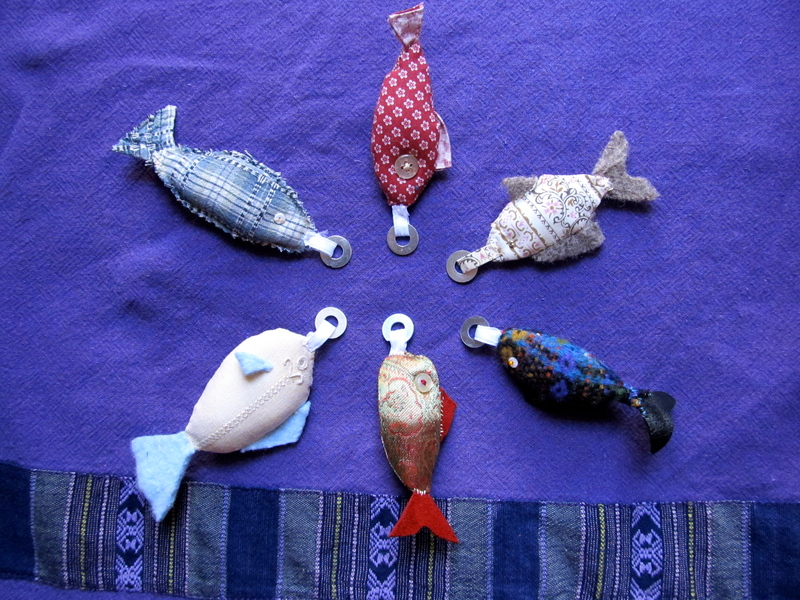 Here are the fish, complete with non-cancer-causing washers. I have a few more partially completed fish. 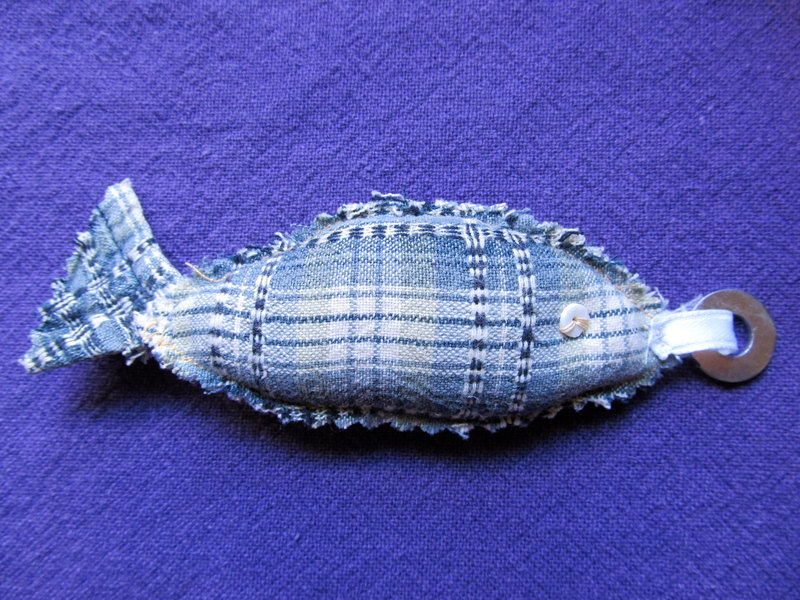 I think I may keep making fish from time to time as I create more cloth scraps while sewing. It’s a fun hand-sewing project that is easy to take along for times when I can take a cafe break or need to sit in a waiting room by myself. I also have another branch cut and scored for a second fishing pole. I just need to braid the candle wick yarn string and drill a hole in another magnet. Now I just need to decide if I will give this to Eli now, or hold onto it until Christmas. Something tells me I won’t be able to wait! i really like this project and want the book – very scary though that the metal could be so dangerous and such warning easily overseen if it wasn’t printed on the packaging but at the store on the shelf e.g. if the washers had been sold loose. I’ll have to check next time I am in the store if that type of washer is also available in the bulk bins at the store. If I had bought them that way I never would have realized my mistake! And since I didn’t need an exact size but rather just something smallish I wasn’t scrutinizing the details but just trying to grab and go. I love your philosophy of quality over quantity. I think it’s an important message to send to kids from early on, that we can have things in our home that are durable, meaningful, and beautiful. The fishing set is so adorable! so fun! I go crazy over homemade toys, so I’ll leave it at that. Thanks for another fresh, honest, and creative tutorial Karen! What a great play set! I love Waldorf inspired toys. We still have plastic toys as well and likely always will. Some of my favorite toys I have made for our girls come from the blog Wee Folk Art. They have a link to wool felt central and while the wool felt is more expensive than that at Hobby Lobby it is very nice and they sell bundled that give you a nice selection. I truly love the idea if using old clothing items. I love the Wee Folk Art site! Thank you for sharing it with me! It will be great to find some affordable wool felt. What a wonderful idea. I hope I can become more crafty as I transition to a stay at home mom and have more time to tinker around the house instead of being gone from 6:00am to 5:30pm. I would love to make my own toys for my girls! I am considering home schooling but it will depend on where I am living and the schools available to me. I have so little faith in the school systems these days and I feel, armed with the proper materials and plans I can do a much better job. Keep these posts coming! Wow, what a long work day! That must have been so difficult and exhausting! I’m sure you will be a fine homeschooling Mama if you decide to go that route. There are so many styles and materials out there, and it seems to me the homeschooling community is very generous with advice and support for one another. I’m sure you will be able to find the way that fits best for your family after a little experimentation. This play set is perfect! I prefer your ‘fish’ made of special clothing, rather than the felt. I’ll have to tuck this idea away for my grandkids when they get a little older. Thanks! It still feels a bit strange to me to be able to make toys that have small choke-able items on them like the buttons and washers. He was so recently a baby! Those look amazing! I totally think quality toys trump a ton of toys. I tend to notice that an overwhelming number of toys deters kids from focusing on a few and really getting a ton of out of that one toy. I’ve read on those three types of schooling too; the most common around my area is Montessori. I’m interested in seeing if reducing the number of toys in our home will make a big difference in Eli’s ability to focus and go deeper in his play. At least it will help the house have a more calming atmosphere! You are just good…how easy would this be for a novice seamstress? As in, “I only sew straight lines & pajama pants” novice. Honestly I think you could do it. Just sew almond shapes leaving an area open to stuff. On most for the sake of time I did tis on the machine, but I also made a couple by hand. The rest is all done by hand. I used felted wool or leather scraps for the fins and tails, free hand cut them out and trimmed them until they looked right. These I then just whipstitched onto the stuffed fish bodies. Embellish as you want. I used beads and buttons. In the book they used sequins as well. The washer is attached by a doubled length of ribbon that is also whipstitched in place. I think this is a perfect project for a novice! We’ve loved making projects from this book as well. The all-time favorite so far has also been the simplest: the ring with ribbons tied on pictured on the front of the book. A word of caution: don’t play with felt toys on the floor unless your house is cleaned a lot more often than ours! On the subject of schooling, what we love about homeschooling is that we don’t have to pick just one theory…we mix and match whatever we like. Thanks for the advice about felt toys on the floor. I can see that we’d be employing the lint roller fairly often if I end up investing in some felt for toy making! The mix and match aspect of homeschooling is one of the most appealing aspects to me. I want to learn enough about each approach to know why things are done certain ways. At this point I’d just be making very superficial decisions based on what I can envision most easily or what seems like the most fun. I probably should have started out by reading about one approach and then another. Right now I have multiple blogs I’m visiting (and all their links) and am half way through about 4 different books as well. Consequently I’m now having trouble keeping it all straight in my brain! But I know I’ll get a handle on it soon enough. I’ll probably choose one as sort of a main framework and then add in elements of other styles. I used to be an elementary school teacher. I saved boxes of files and many books, but now I wonder how much of that stuff I will ever actually use now that I am seeing my son’s personality unfold and am learning about so many exciting alternatives! I had so much fun researching all the options too! And once we settled on what we were doing…we changed our minds. We’re also finding that different kids have totally different needs. We have been doing “homeschool preschool” with our three year old in a very non-structured, go-with-the-moment way but when we started homeschooling my 14 (then 13) year old brother last fall, we quickly discovered that he needed a lot of structure to thrive. I am extremely unstructured go with the flow in my approach to life. I’ve been considering lately based on some books I’ve been reading if Eli wouldn’t benefit from more structure. I don’t know as we’ve never had a whole lot, but just last night I was up making plans and schedules. It is really going to be a stretch for me but I’m going to give it a try and see how it goes, especially now that I am getting ready to implement homeschooling more intentionally. It is fun to explore the many ideas out there! I love this fishing set! Ugh, I have to wonder what was in those washers. I may be a little lead paranoid, but that was my first thought. Not cool! I’ll be excited to hear more about your home-schooling journey. We have no plans to homeschool Joe (well, to be honest, we almost certainly won’t homeschool him), but I was homeschooled for part of my education, and I definitely want to incorporate some homeschooling into Joe’s life, whether or not he’s in a traditional school environment. Resources for homeschooling seem way better now than they were when I was being homeschooled – back then, it was a pretty lonely business, but I think it’s so much better now, at least in urban areas. I’ve been amazed at the amount of resources available. Now it seems the problem is more one of how to go about choosing what you want to incorporate into your approach. At what ages were you homeschooled? Of course, attending a formal school in no way precludes a family from home education. I’d be interested if you choose to blog about the activities you do with Joe. I may end up enrolling Eli in a preschool a couple days a week so he has more exposure to other children for language development. It just depends on how he’s coming along in that area when the time comes. What an adorable fishing set. I think the effort you put into making his toys means all the world. And focusing on natural, quality toys instead of a *ton* of toys is important. I know some young parents with kids who have so many toys that the kids don’t really appreciate them anymore. When someone gives them a new toy as a gift they say “cool” but in a few minutes it’s thrown into a pile and forgotten about. So sad. That is sad, but understandable how the kids got to thinking that way. One book I’m reading describes the thought process as I have so many toys that no one toy has any value. Since I don’t have anything of value, I think I need more toys.” This will in turn become a major factor in a lifetime of consumerism, perhaps debt, and lifelong dissatisfaction. Not the kind of gift anyone wants to give their children, but so easy to do without realizing it! Thanks, Tamara! I guess maybe the normal usage would be in projects where they wouldn’t come in contact with food, or once in place, casual touch? Maybe the cancer causing treatment was part of the the galvanizing process that I believe is to prevent rusting. But surely there is a less toxic way to do so. It’s made me wonder what chemicals could be on already assembled items in my environment where the parts are long separated from their original labeling. I know after this I’ll be checking labels a lot more closely! As for schools, I am very much pro Montessori. I only know a little about Waldorff, but I’ve had some friends look into it. One friend was considering actually working for Waldorff. Instead though she decided to go through the Lifeways program. Are you familiar with that? She’s almost done with the certificate program. She told me that she really enjoys it. Here’s the direct site for it in case you are not familiar with it: http://www.lifewaysnorthamerica.org/. My friend is originally from Chicago but married a guy from California so she moved out there.. she’s in Sacramento now. I love these fish! I think I’d seriously have so much fun playing with them myself 😉 I seriously want to make these. Awesome post! Thanks, Michelle! I’ll admit I’ve done a bit of playing with Eli’s toy myself! I love this idea. The fish are too cute. Thanks so much for sharing at whimsy Wednesdays. You’re welcome. Thank for hosting the opportunity for linking up! Hi Karen! What a cute idea! It’s so nice to meet you and I am delighted that you are sharing this lovely idea at Potpourri Friday. I hope you make it a weekly party stop! That looks like a great book– I’m going to check it out! Your fishing set looks amazing…crazy about those washers! Thanks! Yea, the book is wonderful, just full of great, not too difficult ideas! I highly recommend it. I got this book from the library once. Thank you for reminding me of this wonderful book!!! I really loved it. Must get it again soon…Oh and I LOVE your fishing set! Absolutely beautiful. Your fishing game looks great, and I love that you’ve made it using pre-loved fabric!!! I totally agree with you on quality rather than quantity. A combination of quality (even if expensive) toys and handmade toys is a good balance. I’m looking forward to the day when he’s old enough to have memories of favorite pieces of clothing that I can then re-use for him, so that not only will it be pre-loved fabric, but fabric pre-loved by him.